We feel like every time we step into Hollywood Studios these days, we get a whiff of that new car smell! Ok, maybe it’s not a new car, but it seems like it’s always something new at Hollywood Studios. The best part is that it keeps us excited to see what launches next. The latest piece of the Hollywood Studios puzzle is the Grand Avenue and a sweet little corner pub known as Baseline Tap House. Before getting your pub happenings on, let’s chat about 8 things you need to know! 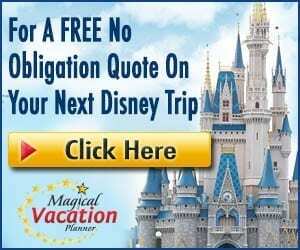 Because Disney World is awesome, they always offer a story to go with everything from attractions, to shops, and yes, even lounges! Baseline Tap House is no different. Baseline is themed to be a “mom and pop” corner print house (paying homage to the Figueroa Printing Company) that once partnered with Disney Studios. Transformed into a lounge/bar setting, you’ll notice the modern-day downtown Los Angeles atmosphere evident in the exterior and interior aesthetics with brick, tree canopies over the terrace, and metal piping inside. It’s easy to feel the comfortable atmosphere in this space that makes you want to pull out a pad of paper (or your phone these days) to let your mind transcribe new ideas. Nestled on the corner like any good bar would be, Baseline is perfectly situated neighboring Sci-Fi Dine-In Theater, at the very end of Commissary Lane. What used to be blocked off for future construction, now reveals Grand Avenue. To visit Muppet Vision 3D or PizzeRizzo, you now must walk by Baseline Tap House on Grand Avenue which makes Baseline super easy to spot. Even though Baseline was extremely new when we visited, it had a healthy buzz to it without the overcrowded feel we expected. We especially loved the outdoor seating area which boasted the tree canopy we mentions above and stool seating around table tops with red shade umbrellas. The street lights and the stream of lights over the outdoor area make for a beautiful glow at night. Once inside, the very modern atmosphere evidently fills the room with just a few high top tables, a lengthy bench with views out the window unto the outdoor seating, and metal piping and light fixtures. Items from what look like the print shop lines a few shelves behind the focal point which is the modern, steal top bar. It was a calm environment inside but there was still plenty of chatter and laughter that made it feel like a friendly bar/pub. Chances are we’ve likely all experienced a noisy neighbor at one point in time or another! Well, to our surprise, Sci-Fi Dine-In Theater has an open door within Baseline Tap House that connects the two, so you don’t have to go outside to enter one or the other. At first, we thought – great! But as we pulled up a chair, we noticed that host/hostess kept coming into Baseline shouting names… as they were looking for the next party to be seated at the restaurant. While we love the idea of getting a drink while we wait for a table at Sci-Fi, it got old pretty fast listening to the server shout out names of guests in such a “chill” setting. 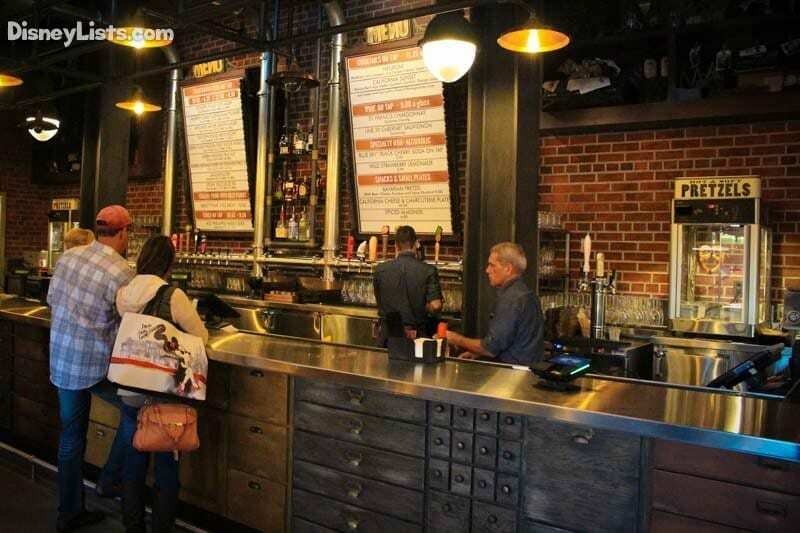 It is a Baseline “Tap” House so, let’s get to the drinks you’ve been wanting to know about! The tap choices were on excellent display with large menu signs as well as smaller handheld menus you could browse while waiting for a bartender. Featuring California beer on tap, you can select between a 16 oz. or a 22 oz. Some beer on tap choices include the Golden Road 329 Lager, North Coast Scrimshaw Pilsner, Napa Smith Lost Dog Red Ale, and Stone Delicious IPA – just to name a few! We do however highly recommend trying an assortment which is made easy with the Create-Your-Own Beer Flight option of four, 5 oz. drinks. Cocktails and wine were also on tap but with fewer options than the beer selections. As far as cocktails go, we weren’t overly thrilled with the California Sunset and would recommend the Negroni instead. Two non-alcohol specialty drinks included the Blue Sky Black Cherry Soda on Tap and the Wild Strawberry Lemonade. Our daughter tried the Blue Sky Soda and wasn’t impressed. Go with the Lemonade instead! Keep in mind, they list several of their “spirits” on the menu so you can request a specific drink you are craving from the full service bar. Don’t come to Baseline Tap House hungry, as you’ll end up leaving hungry or full on drinks! They do offer three snacks/small plates including a Bavarian Pretzel with beer-cheese fondue and spicy mustard, a California Cheese and Characuterie Plate, and Spiced Almonds. The pretzel was like any Disney pretzel out there but the beer-cheese fondue that came with it was tasty! The cheese plate would likely be our next option over the pretzel or almonds next time around. If you aren’t grabbing a drink to go, we’d highly recommend staking out a table as early as possible. Baseline is open at 11am and typically this is a good time to arrive as most guests as seeking lunch plans at this time. The bartenders will also ask if you are sitting inside our going outside as the cup they prepare your beverage in will be glass if staying in or plastic if you go out. Our daughter’s non-alcohol beverage came in a solid white plastic cup, and alcohol came in clear plastic. Different snacks containers were available as well depending on if you were going to sit inside or outside. Overall, we would visit Baseline Tap House again but wouldn’t necessarily go out of our way to do so. Hollywood Studios has two other lounges which include The Hollywood Brown Derby Lounge and Tune-In Lounge. 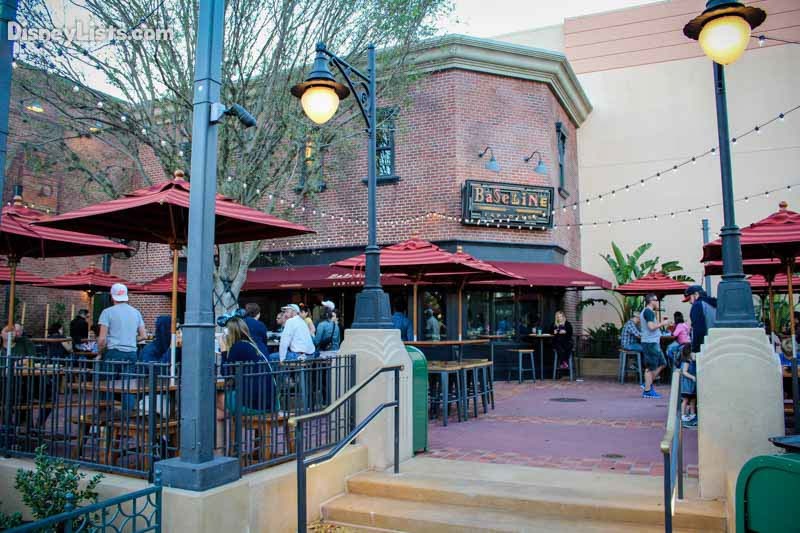 While Baseline Tap House does have the best variety of beer on tap and has an awesome atmosphere, we’d still rank the drinks and snacks below the other two lounges mentioned above at Hollywood Studios. Again, not to say you should pass it up, but to say it’s worth checking out only if you are in the new Grand Avenue area. Baseline Tap House service was definitely on point! There were plenty of Cast Members bustling around sweeping the outdoor space, emptying the trash both inside and outside, cleaning up tables, and greeting everyone and anyone with sweet smiles. The bartenders (three when we visited) were busy but obviously knew the menu well and were quick to act. 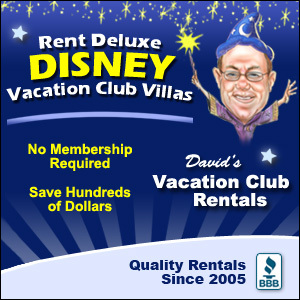 Friendly and efficient service – exactly what we’d expect from Disney! 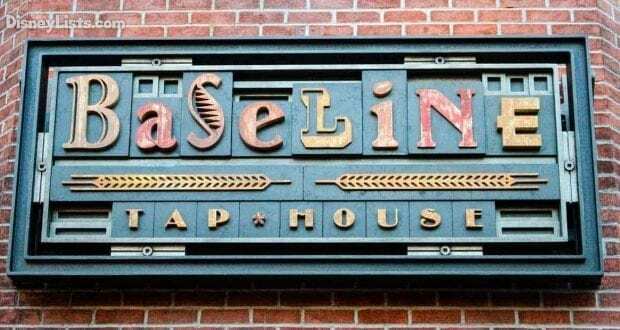 Have you had the chance to check out Baseline Tap House? Let us hear about your experience!